The (Grand) Strategy category of video games has been a big, rather grand part of my life, going back to my first experience with the genre in Christmas of 1993 with Sid Meier's Civilization on the Amiga. I’ve tried to play as many entries in the genre as I could and it’s hard to pick a favourite type, because most assuredly there are different facets that make each title or franchise unique. The Paradox (Crusader Kings, Europa Universalis) 4x titles to the Civilization franchise showcase minutiae management — German Panzers show up with slingers on the battlefield because of tech-tree mismanagement. The Total War series had ground-view battle planning, where it was rewarding seeing war dogs harass Triarii and break their lines. Now, could you believe a game exists that comprised elements from all? Is it ten Christmases rolled into an Easter? Some delightful fever dream cast upon you by a perturbed gypsy? 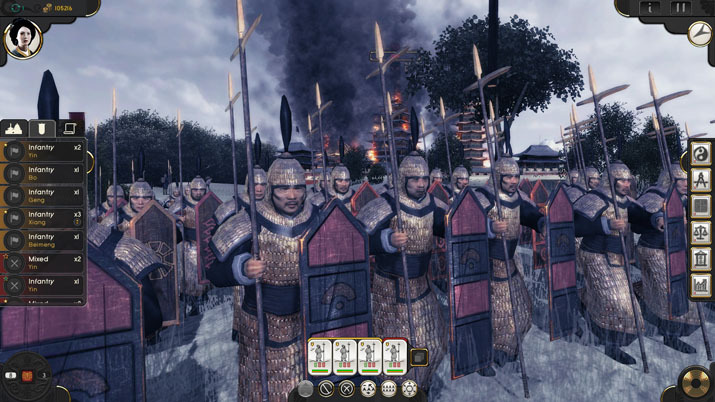 No, mate: Shining Pixel Studios’ Oriental Empires is here. The subject of Oriental Empires is Bronze Age China. What I know about China could be compartmentalised into a six-week course at a junior college located in the same carpark as a Planet Fitness. I went to China twice; once as an impetuous adolescent when Hong Kong was returning to Chinese control after British reign, but all I brought back from that trip was a Hello Kitty bum-bag and disillusionment for imperialism. I went again as a man, where I absorbed as much as I could about history, baijiu, food, and Mandopop. Suffice it to say, there is a fond space in my heart wherein China resides. 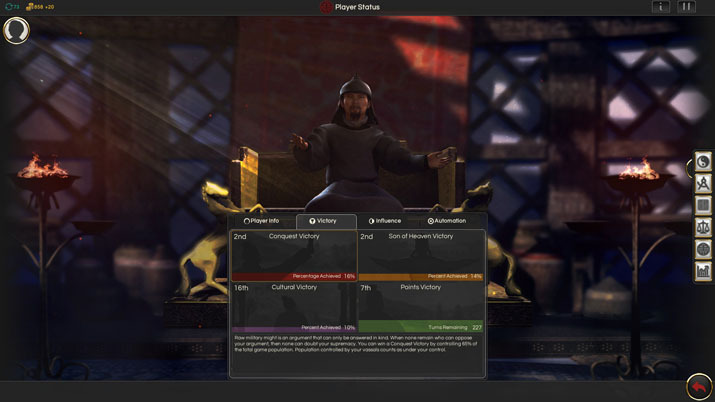 In Oriental Empires, you choose one of five starting factions; Shang, Chu, Shu, Zhou and Han (unlock ten others after playing the game for a while). Under each name, there are little blurbs about each kingdom, so you can place key historical events to a name, like the difference between Han the group and the Han dynasty — completely different. Perhaps you’ll find it as interesting as I did since this time period isn’t well represented in video games unless you count Dynasty Warriors. In writing that, if you do enjoy the Three Kingdom period, this title has that too - Shu and Wu as playable factions! “Hold on there, Pythagoras that’s only two,” I hear you say. “What of Wei, home to the beautiful Wang Yi?” Well at this time the Wei region was under Qin, so it’s there too! 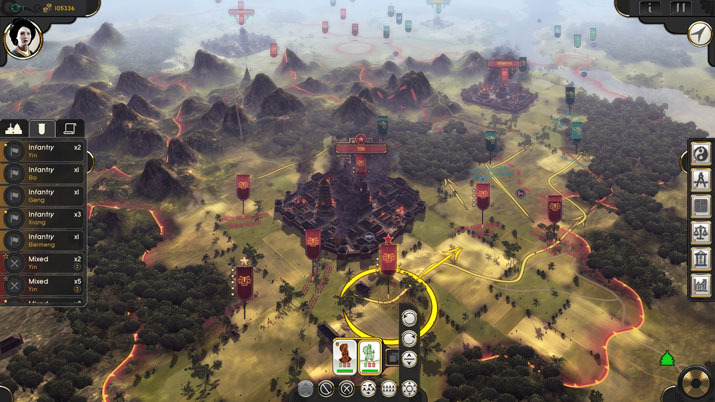 The mechanics of Oriental Empires are not difficult to understand even if you’re new to the genre, if you played a grand strategy before — this is familiar territory. Menu is nothing new; Diplomacy, Economy, Stats, Tech-Tree - the gangs all here. There is a correct frame of mind, i.e., “I’m going to play one game for thirty plus hours.” Don’t fret, as there is no Zerg rush, no five hundred cataphract tearing down your walls after ten minutes. You want to get ahead, want to see the unique options represented in each empire, but it’s the journey not the destination. Even one hundred turns in, I’ve only scratched the surface. You really have to baby your starting city, don’t build everything – the peasantry hates it. My first playthrough, every time the helper said to build a settler, I did. I had six cities, everyone was cross, revolts, bandits, no roads; it was a mess. Pick what each city is going to focus on, get walls up because they will save you from opponents just walking up with a unit of peasant spearman and declaring your place theirs (another imperialism reference, so meta). Also, if you don’t have roads, your units move slowly, so when declaring war with someone, move your armies up somewhat close to the nation you want to fight. Tech is important, four broad branches on the tree: Power, Craft, Thought and Knowledge. Start by smelting bronze to discover gunpowder. They even wrote that is was discovered by alchemists trying to find immortality, which is true, yet I have a small gripe: they called it “Fire Medicine,” though I think that was just the mixture of saltpetre and sulphur — the term wasn’t even employed until hundreds of years after the invention. Think of it like most ambiguities when it comes to literature, the term Blitzkrieg being a perfect example: not really used by the Germans, but it sounds more impressive than Angriffsschlacht. I focused on cultural advancement to keep my plebs pleased, though it didn’t do much because they despised having to build a barracks and copper mine in the same city. Authority technologies keep your gentry glad: this is your professional army. You need a majority of professional soldiers in your army to be a threat to anyone unless you enjoy seeing two chariots destroy eight units of peasant archers and spearmen. Battles don’t have that real-time overview a la Total War, but frankly, I had other things to worry about than some archer unit losing morale, so the issuing of simple orders, positioning the army how you like, and then letting the battle auto-play was refreshing. Like with most grand strategies, I lost track of time and three hours melted away, it will happen to you, too. As far as aesthetics, Oriental Empires is beautiful, even on older systems. I played on a six year old laptop on which just opening an email link makes the fan sound like a hovercraft from a dystopian film — “Chrome, witness me, I will usher this PDF to Valhalla!” Sprite design is well done even zoomed in all the way, without looking like faceless blobs. Musically, I wanted more diversity, so I just used the Wuxia playlist for when I play as a Chinese culture in other grand strategies (yes, really). I hope this will be a trend and Shining Pixel does more in the genre of grand strategy, for more cultures glazed over in other titles. I would love to see a project about the Phoenicians or Etruscans... but that just might be me. Oriental Empires shall surely frustrate some players, though that really boils down to his or her shortcomings, not the any of the title. You shouldn’t be upset about historical accuracy: plagues happened, bandits are terrible, and — who would have thought — peasants hate building things for their oppressive overlords because they’d rather be with their families. Sitting down and learning how to be a sovereign to the people and not just field marshal to armies will open players up to a superb experience in the genre. The foundations of other efforts in the genre may show, but ultimately, Oriental Empires builds upon them anew, just like real life. David is a fine purveyor of snark, has passion for wine both boxed and canned, thinks Yummy Mummy was the best monster cereal and tries his darndest making playlists comprised of reggaeton and K-pop. David will fight you over what the greatest tea is (Lapsang souchong being the correct answer) enjoys travel and historical cookery. He also finds it odd that a goblet is a container and not a wee goblin.